Rock Forest, Lennoxville, Fleurimont, Ascot, Deauville, Bromptonville, and Saint-Élie-d'Orford were annexed to Sherbrooke 01 January 2002. (Jean Breton 2009). Incorporated September 1895 (Que.) as the Sherbrooke Railway Company. French version of the company name cited in the act, la Compagnie du chemin de fer urbain de Sherbrooke, little used in public. Name changed in 1896 when control was acquired by Americans W. Burke and James Flood. 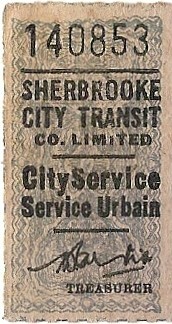 Street railway service in Sherbrooke and to Lennoxville. Control was acquired 1910 by McCuaig Brothers & Co., Southern Canada Power Company interests. Incorporated 1909 (RFC). 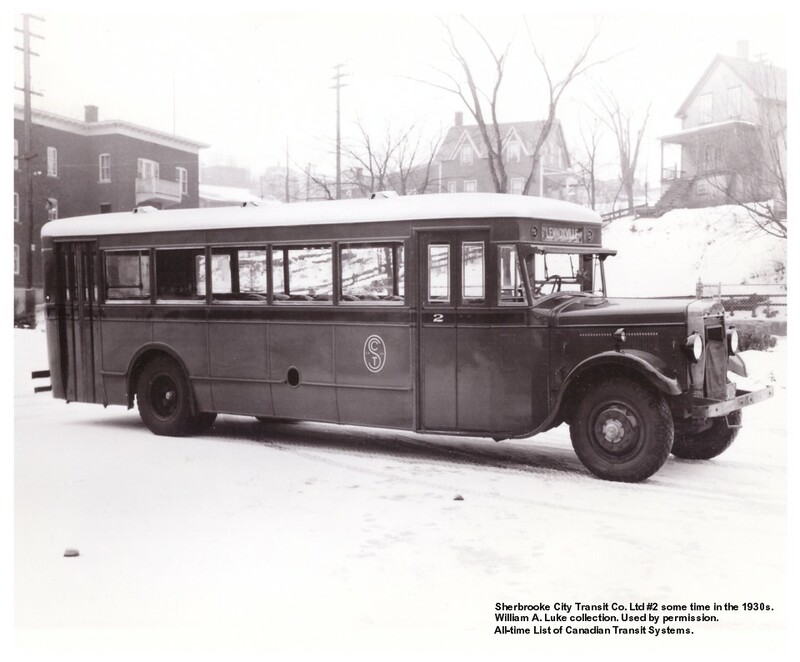 First bus service begun 1928. Subsidiary of Colonial Coach Lines, a Provincial Transport Company subsidiary. Franchise effective 01 February 1932 (CR&MW May 1932). Service abandoned at the end of 1951. (Jean Breton 2009, CRHA News Report , photo: William A. Luke). Name changed to ST Inc. 1962. (Jean Breton 2009). Acquired by CMTS. (Dawes et al. 1972, CUTA 1976-77, Jean Breton 2009). Transit service in Sherbrooke. (Jean Breton 2009). Name changed in coordination with municipal amalgamation. Transit service in Fleurimont became the responsibility of the Sherbrooke system in 1985. Fleurimont was annexed to Sherbrooke 01 January 2002. Service in Fleurimont assumed by CMTS 01 September 1985. Saint-Élie-d'Orford was annexed to Sherbrooke 01 January 2002. Provincial map of 1995 shows a municipal bus service from Saint-Élie-d'Orford to nearby Sherbrooke (email 1996). 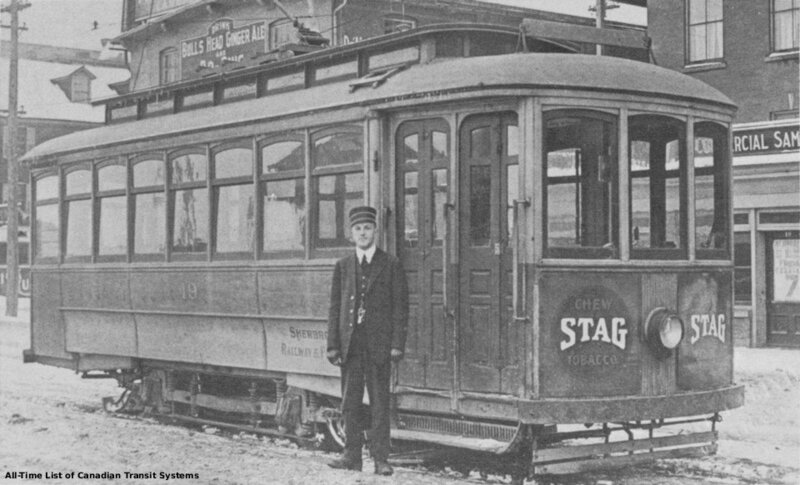 Kesterman, Jean-Pierre, Les char électriques: Histoire du tramway à Sherbrooke 1895-1932 , Sherbrooke: Productions G.G.C. ltée, 2007. La petite histoire du transport en commun à Sherbrooke [booklet], 2003. “Sherbrooke Railway & Power Co.”, C.R.H.A. News Report , February 1962, pages 24 - 29.